In 1974 he tried to run as a candidate of the United Citizens Party, a splinter group of the Democratic Party, but took less than one percent of the vote. In 1976, he wanted to challenge Davis in the primary, but didn't file his paperwork correctly. In 1978, he tried to unseat incumbent Democrat Davis again. 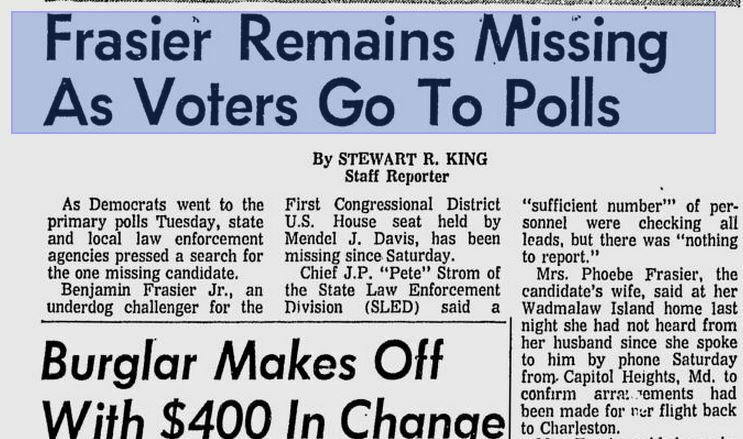 When Davis retired in 1980, Frasier entered the Democratic primary against the well-known Charles Ravenel. Two strong Democrats entered the 1982 race for this office, and so did Frasier shortly after. One of the primary candidates withdrew, but Frasier still only came in third. After that prominent loss, Frasier contested that votes for that withdrawn candidate shouldn't be counted, and he forced a runoff (in which he was also handily defeated). When the incumbent Republican retired in 1986 and Mendel Davis ran again for his 1st Congressional District office, Frasier again entered the Democratic primary race. In 2004, South Carolina had an open Senate seat. Frasier entered the primary to challenge a well-known Democratic woman (Inez Tenanbaum). He is also suspected of trying to hide where he got the money to pay the high filing fee for that race, which he paid with a cashier's check. "It is the only filing check the party has received that didn't come from an established campaign account," the Post & Courier reported that year. Frasier also continued to list a Wadmalaw Island address as his home, even though records showed he sold that address in 2002. In 2006, when incumbent Henry Brown first appeared to be weakening his hold on the 1st District, Frasier entered the Democratic primary and forced a runoff. In 2008, when Republican Brown's hold was weaker, and when the Democratic Party had viable and well-funded candidate Linda Ketner, Frasier entered the race. In 2010, after Brown announced he wouldn't run again, Frasier again ran in the Democratic primary. And to the shock of Democrats throughout the 1st Congressional District, Frasier joined the ranks of Alvin Greene that year by scoring an upset win against a prominent candidate. Frasier did pitifully in 2010's final election, getting only 28.6 percent of the vote, but it didn't seem to matter to him. After the primary upset, his work was done. In 2012, Frasier didn't run for any office (but he still collected campaign funds and received two warnings from the FEC). When asked why he didn't campaign in that election cycle, he told a reporter "they told me to stand down." Frasier refused to tell the reporter who "they" were, though. Which brings us to this special election in 2013. According to local news: "He said 'they' told him to run, but did not specify who the 'they' was when asked." He continued to list that Wadmalaw Island address to be his home, even though records show he sold that property in May 2002. In that 2013 race, he stated at a local NAACP meeting that “If you don’t vote for me, then vote for the other party.” He lost the primary brutally, getting less than five percent of the vote. Afterwards, he endorsed Republican candidate Mark Sanford. Forty-one years of tomfoolery is enough. Tell Frasier to give it up.